I think everyone has those days where they just want to relax and do some personal pampering. I haven’t been an avid LUSH shopper until I moved to an area where I had a store to go to. I had heard a bunch of great things about them and how awesome their products were so I wanted to try some of them out. I decided to get a few things my last shopping trip and I’m happy with my choices considering they have so many things to choose from. I could spend a good hour in the store just smelling and trying products. Bubblegum is the perfect lip scrub and taste exactly like bubblegum. I truly am obsessed with it! 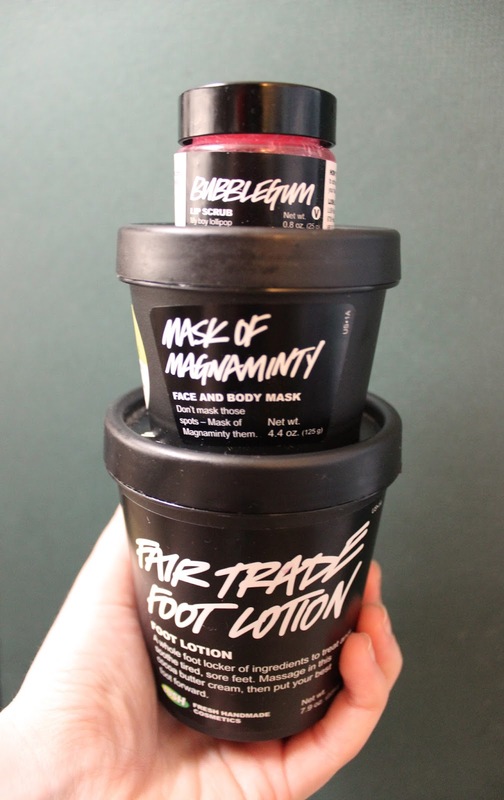 Mask of Magnaminty is a pepperminty face mask that works amazing. I normally don’t purchased face masks because I didn’t used to wash my face much (I know, horrible! ), but I recently have been testing out face products and loving a lot of them. This one really makes my skin feel smooth and refreshed after using it and I think it’s going to be a weekly product. 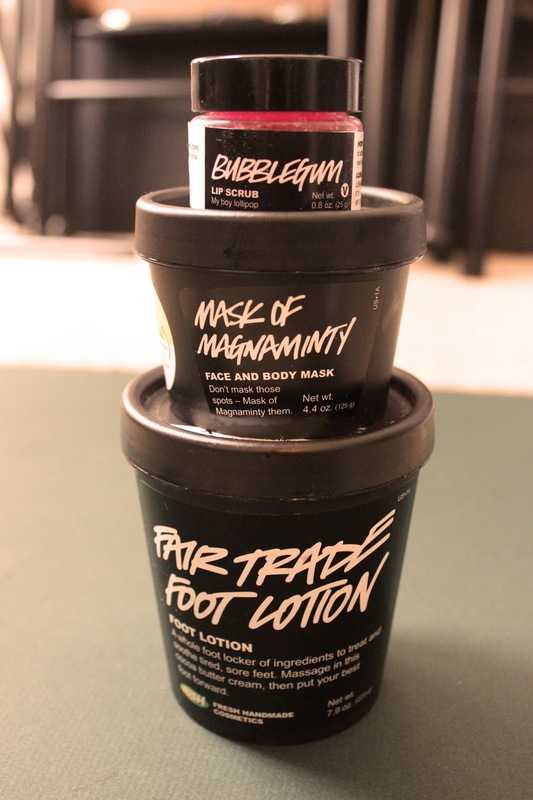 Fair Trade Foot Lotion is not new to me. When I first purchased LUSH a while back this was one of the first products I tried and loved. I put this on after being on my feet all day and slept with it on. The next morning my feet not only smelled great, but felt amazing. I love LUSH because they have mostly vegetarian and some vegan products, not to mention they don’t test on animals which I love. 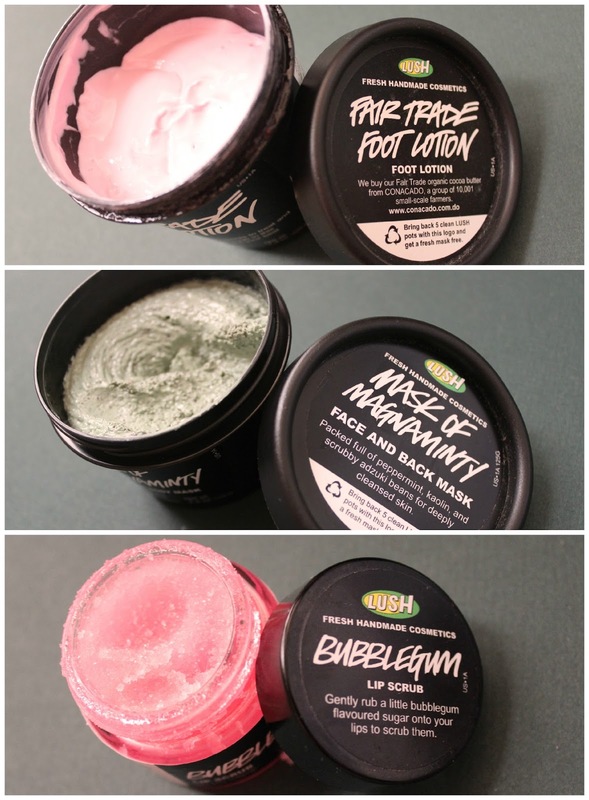 If you haven’t I would check out lush.com and do some research on the company and some of the products and then purchase some! You won’t be disappointed!